Insurance Advice for Residents in the Path of the Las Conchas Wildfire & A Warning for All New Mexico Residents to Be Prepared During Wildfire Season. June 28, 2011 – As the massive Las Conchas fire continues to burn out of control this morning, residents evacuated as a result of the blaze need to contact their insurance agents or company representatives immediately to provide them with emergency contact information. For homeowners or renters who are under a mandatory evacuation order they may have insurance coverage for "additional living expenses" or "prohibited use" which provides them with a certain amount of out-of-pocket money under their insurance policy while they are forced out of their homes. "Evacuated residents should contact their insurance agent or company representative immediately to let their company know how they can be reached and if they need additional living expenses while they are forced out of their home," says Carole Walker, Executive Director of the Rocky Mountain Insurance Information Association. "As residents are allowed to return to their homes, document any damage and take photographs to provide to your insurance adjuster." In 2000, Los Alamos suffered the state's most costly wildfire as the result of the Cerro Grande Fire destroying more than 220 homes and causing $174 million in insured losses (adjusted for inflation in today's dollars). The federal government also paid out homeowner and business claims as it was determined that the fire ignited as the result of a controlled burn by the U.S. Park Service. Residents evacuated from their homes should contact their insurance agents or companies immediately and let them know where they can be reached. 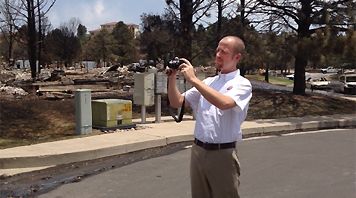 As adjusters are allowed into the burned-out areas they will want to go in with their policyholders to assess the damage. Contact your agent or company if you need additional living expenses while you are out of your home. Keep receipts. Out-of-pocket expenses during a mandatory evacuation are reimbursable under most standard homeowner policies. Be prepared to give your agent or insurance representative a description of your damage. Your agent will report the loss immediately to your insurance company or a qualified adjuster who will contact you as soon as possible to inspect the damage. Again, be sure to give your agent a number where you can be reached. Prepare a detailed inventory of all damaged or destroyed personal property. Be sure to make two copies – one for yourself and one for the adjuster. Your list should be as complete as possible, including a description of the items, dates of purchase or approximate age, cost at time of purchase and estimated replacement cost. The standard policy does not cover flooding, so you may want to look into flood insurance coverage if you're concerned that you're at risk for rising floodwaters. Flood insurance must be purchased 30 days in advance of a flood claim.